When I was little, my parents used to drive us around the nicer neighborhoods and we would look at the homes. I would always wonder what their interiors looked like. It was always so fascinating to me. When it would get darker in the evening, if you were lucky, you could catch a glimpse and see inside even better! Luckily for me, our Dallas area has many historical neighborhood committees that allow homes to be featured on some amazing tours. I've had the privilege to experience several now with my daughter, Alex. This weekend, for the first time, we experienced the Junius Heights 9th Annual Home Tour and it did not disappoint! Junius Heights is Dallas' largest historic district, a neighborhood of more than 800 homes in East Dallas, Texas. All homes were incredible but Alex and I narrowed it down to our top three.... And here they are! Enjoy!! This home really caught my eye! And how couldn't it!! The current owner has it decked out with furniture and accessories from his travels from all around the world! It was incredible! Every inch of the house had an incredible find, after incredible find. As I was walking through the living area, I heard one woman tell another woman, "That's what I see, when I'm walking past this house! That boat, at the window!!" I guess I'm not the only one peeking thru windows! Your jaw dropped from the very beginning of this home. These two large mermaid sconces were from a hotel in Miami! There were two of these incredible pieces that planked the dining window, giving this room a great dramatic affect. The breakfast nook has this incredibly large backed bench which fit perfect in this space! Oversized and all! As you go up the stairs you find more, great world travel finds, literally all along the stairwell wall! And every bedroom was decked with beautiful furniture pieces. Your eye couldn't catch it all! I feel like I need to go back and see what I missed. This next house, we fell in love had such charm and eloquent thought to its design! Just almost complete, this newly renovated home had beautiful windows that captivate your eye from the street. The living room entices you with a two way fireplace, which on the other side, is the patio that is literally in the center of the home! Just fab! The sleek kitchen is just precise and perfect, ready for some great entertaining! 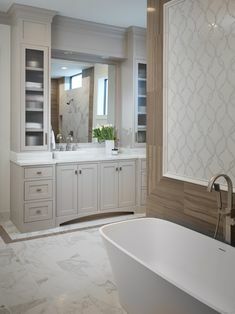 The unique master bathroom incorporates a beautifully designed shower/tub area with a wall to wall shower niche. 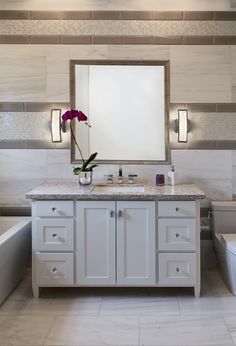 The bathrooms were all completely modern and stylish! 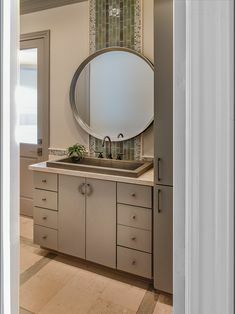 The handsomely designed powder room was certainly a head turner! And, how can you not love the "sweet" doggy room! Too cute for any four legged friend, it was thoughtfully designed, dog wallpaper and all!! Lastly, this "home" was amazing! Once a church, the new homeowner kept many of the original architecturals!! You literally feel like it's still a church with the cathedral ceiling, gothic inspired carvings and stained glass windows. Once you enter, you are greeted by an open area which is the living room, dining, kitchen. The details, existing and newly designed, kept your eye in amazement as you toured the home. The cathedral ceiling along with original cabinetry and doors were purely beautiful! The upstairs greeted you with some beautiful beams and trusses! The larger beams consisted of five 1xs which I hadn't seen before. It made for an interesting look. For now, the upstairs is all open. Can't imagine, what they'll do with it! Kitchen and mud room were added and they seem to have kept a lot of the church's beautiful charm. Now, what really catches your eye both in the exterior and interior, have to be the windows!! Can you say, Amen!?? They were simply mesmerizing! This tour was definitely one for the books! I can’t wait to visit next year’s tour with my little Alex! See you at next year’s Junius Heights’ tour!